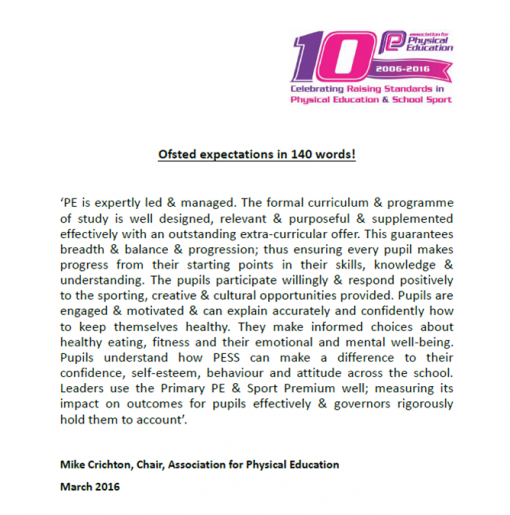 AfPE's Chair, Mike Crichton, has developed a document that outlines Ofsted's expectations in 140 words. The intention of the impact statement is for schools to reflect on their provision and determine whether it ‘fits them’ and, if it does, for them to be able to identify evidence that supports the impact statements. The 140 words are collated from each of the most relevant criteria in the Ofsted Evaluation Schedule: Outcomes, Leadership & Management, Quality of Teaching, Learning & Assessment and Personal Development, Behaviour & Welfare. In theory, if a school can demonstrate that their Physical Education & School Sport provision fits the statement then they should be good to outstanding.